In east London, the recent successes of the Focus E15 mothers housing campaign has brought national attention to a growing problem in UK towns and cities: the attack on social housing by local councils. The selling off public housing stock, to then be privately rented out at far higher rents, has become a powerful engine of gentrification in urban spaces, leading to the destruction of communities and the ‘decanting’ of residents to disparate areas. Earlier this year, a similar case came to a head on the other side of the Thames, with demolition beginning at the Haygate Estate in Southwark after a lengthy battle by residents to save the estate. Once home to around 3,000 people, the Heygate was described by residents as “one of the strongest and friendliest communities in the borough” from which many “never even contemplated leaving“. According to residents’ groups, the shambolic redevelopment process has involved disregarding resident views, broken promises of alternative housing and derisory sums offered in compensation that have forced them out of the area – and in many cases out of London entirely. Amidst the violent physicality of demolition and eviction, a focus on language may seem somewhat trivial. But as a key medium through which these actions are facilitated and justified, language is an important point at which future actions can be contested. In an article for the New Left Project, Helen Kearney highlights a significant point about language in the ‘Compulsory Purchase Order’ (CPO) for the Haygate, a document which gives a local authority the power to force the sale of properties against residents’ wishes. By imitating the language used in the CPO, Kearney creates a subversive alternative, proposing to regenerate the lavish and largely unoccupied luxury apartments of One Hyde Park. The curious way in which the meanings seem to hang off this structure equally well in both versions of the CPO mirrors how Žižek characterises similar language slot-filling in academic discourse: that this “purely formal operation which brings about the effect of depth is perhaps ideology at its purest”. By taking a closer look at a key moment in the original CPO, we can uncover how language is used to construct this linguistic ‘scaffolding’ upon which is then hung a pro-gentrification ideology – both in the case of the Heygate, and across gentrification legitimising discourse. 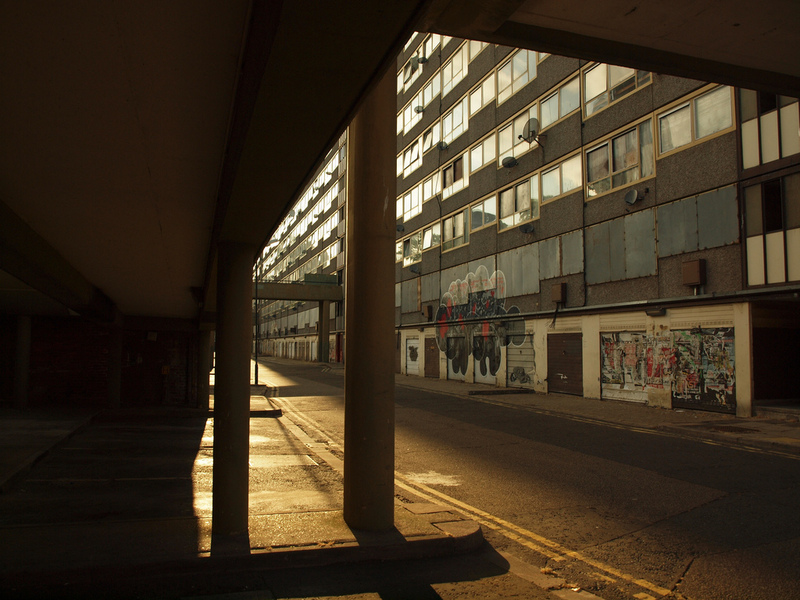 The Heygate Estate suffers from physical, economic and social problems typically associated with similar ‘system built’ estates. The line that opens the justification section of the CPO may not at first glance seem overtly ideological. Aside from the emotive flavour of ‘suffers’, it’s a far cry from the brazen media language presenting social housing as ‘hellholes‘ and ‘rotten places‘. But to succinctly represent any complex social reality through language, a speaker or writer will always have to reduce that complexity, and that involves the selection of particular features and focal points. No matter how innocuous a sentence or utterance may seem, the language will be constantly directing our attention to certain elements whilst backgrounding or suppressing others. Given that the word ‘suffers’ is already crying out for our attention, it seems a good place to start demonstrating this. It’s an essential underlying theme of the redevelopment project that the Heygate Estate is not merely the location of problems, but part of the problem itself – hence the insistence on demolition rather than refurbishment. It’s imperative therefore that the Heygate’s problems are framed not as externally imposed, but as internally arising, and therefore inevitable or intrinsic to the design of the estate. The use of ‘suffers’ goes some way to constructing this perspective. The response ‘by whom?’ would make no sense here, and so the presence of non-Heygate actors is both hidden by the speaker or writer, and made more difficult for readers or listeners to tease out. Without those external actors being shown, we have no sense of what has brought these problems on or who should be blamed. Ultimately, the estate’s condition can be more easily framed as arising from within. If the effect of this isn’t immediately clear, compare it with the difference between ‘My partner snores’ (i.e. they snore in general – unbounded in time) and ‘My partner is snoring’ (i.e. they’re snoring right now – bounded in time). The bounded instance ‘is suffering’ implies now suffering, allowing the possibility of a past and future that may have been different. But with the unbounded construction ‘The Heygate suffers’ used in the CPO, the past, present and future states are undifferentiated. The Heygate’s problems are de-historicised, frozen in time, as though the present state were a permanent state. These two features of ‘suffers’ which respectively convey internality and inevitability allow the writer to suppress any external and contingent causes of the estate’s problems. But such external causes are incredibly significant, and key to opposing the excuses for gentrification. They can include: how privatised housing markets by their very nature drive neighbourhood decline (known as devalorisation); how the selling off of social housing stock under ‘Right to Buy‘ has left low income tenants at the mercy of these market forces; or how the estate’s problems relate to the general increase in urban clustering of poverty over the past 40-50 years – none of which would be ameliorated by the demolition of the estate. As well as presenting the problems as internal, the sentence construes the problems as caused by the estate. The phrase ‘typically associated with’ is functioning here to construct that causal relationship. As pointed out by Michael Halliday (1993), the phrase ‘typically associated with’ is ambiguous as to direction of causality. For example, the sentence “Lower incomes are typically associated with higher rates of mental illness” remains ambiguous as to whether the illness causes the lower income, or vice versa. In our CPO sentence, is it the case that ‘these estates have created social problems’ or is it rather ‘social problems have been brought upon these estates’? The latter would seem to offer no support to the demolition plans, but the former is relied on. If we’re going to talk about causation, it’s worth noting a horribly ironic historical fact: Prior to being earmarked for regeneration, crime rates at the Heygate were actually lower than the Borough average. The oft-used ‘muggers paradise’ phrase was first coined to describe what the estate became after people were ‘decanted‘ for the redevelopment, when much of the estate lay empty. So not only is this crime problem not an inevitable result of the estate’s design, but in fact the very people who here seek to convince us that it is – the local authority – are actually the ones responsible for creating it. Neither of which is actually justified or elaborated on in the text. This is significant because architecturally similar estates (such as the Heygate’s sister estate the Aylesbury) don’t necessarily suffer from the same problems. As Ben Campkin notes in Remaking London, the physical problems of the Aylesbury were significantly improved upon in the design of the Heygate. Even if it is the case that the Heygate and Aylesbury both suffer certain physical problems, a logical connection that links both to the principles of system-built social housing is not possible. This rhetorical sleight of hand is made possible by how the ‘similar’ and ‘system built estates’ elements are combined within a single noun phrase. For example, in a sentence like ‘These similar system built estates are bad’ the underlined information forms a singular grammatical unit. We are invited to respond with either “yes they are bad” or “no they are not bad” – but in both, the presupposition that these estates are similar isn’t challenged. Compare this to a phrasing that splits the single nominal up into bits: “These system built estates are similar to the Heygate, and they are bad”. With seperated propositions, we’re given room to challenge each individual point. But when they are collapsed into one, we have to know to pull them apart ourselves. So aside from all the causal and historical positioning, how does the language characterise the problems themselves? The listing of ‘physical, economic and social’ creates what Fairclough (drawing on Laclau and Mouffe) calls relations of equivalence, shaping how we conceptualise their significance. Firstly, each of these broad categories – ‘physical, economic and social’ – serves to imply equivalence among the huge number of things they each classify. For example, both cosmetic problems like the presence of broken windows and bigger problems like structural instability would both fall under ‘physical problems’. But these are likely to have entirely unrelated causes, effects and solutions, some inherent to the design of the Estate, and others. As it is, there’s nothing to suggest there are core architectural problems with the Heygate, but rather only minor physical problems: the original architect himself believes refurbishment is all that is needed. The constructed equivalence of all ‘physical problems’ masks this distinction. Secondly, the listing also implies that the three categories are equivalent to each other. Physical problems are placed on the same level of significance as both social and economic problems. Situated issues that are solvable with simple maintenance and refurbishment are made equal to wider social problems like poverty and crime. Whilst these three examples focus on a single facet each, the CPO sentence expresses a number of different facets under a single unified term: “The Heygate Estate suffers from physical, economic and social problems”. This unification of facets assists in framing issues around the building, the people, and the area as conceptually singular – one problem with one solution. The latter example of potential future residents in a sense refers not to a group of real people with real histories, but instead something more like ‘people slots’. This is equally true of phrases such as ‘the area’, ‘local residents’ or ‘the Borough’s community’. For example, if something is said to be ‘good for the area’s residents’, it’s not clear whether this means a) the actual current residents, or b) any potential future residents. The difference is significant because if, as is often the case, post-redevelopment house prices are too high for previous residents to move back in, this is clearly bad for those actual current residents. But an exodus of low income residents, followed by replacement with those on higher incomes, will give the statistical appearance of local incomes having risen. This is then easily framed as an improvement in the area. Construing residents as interchangeable abstract ‘members of the community’ can also mask issues of age, class, race and so on. If the entire previous population of the Heygate – largely working class, from a variety of different ethnic backgrounds and including many elderly people – are replaced entirely by young, white, middle class people, they would still constitute ‘the community’, ‘the area’ and ‘the Heygate Estate’. A survey purporting to show that residents of the Woodberry Down estate were satisfied following redevelopment – failing to mention that this was following many years of displacement of the original working class residents. Under the terms of the Town and Country Planning Act 1990 a local authority must not exercise the power of compulsory purchase unless the development is likely to contribute to “the promotion or improvement of the economic, social or environmental well-being of their area” [emphasis added]. The wording – as noted by Anna Minton (2012) – does nothing to guarantee that actual current residents should benefit. And consider what one anonymous council source said in response to Heygate residents’ protests: “Sticking it out is not an option. The estate is coming down … People‘s health, their lives, children’s education will all be improved” [emphasis added]. In all three examples, there is a significant semantic ambiguity: are the stated improvements relevant to a group of actual current residents, or merely a comparative improvement between two different groups of residents in the same geographical area at different times? As long as the fortunes of these abstract people-slots can be shown to improve on paper, it’s irrelevant to government and corporate bureaucracy whether this actually represents improvements for residents, or is just the result of more privileged people moving in. The list of other communities who are going through or have gone through a process similar to the Heygate is depressingly long. In London alone, ongoing campaigns include those to save Cressingham Gardens in Lambeth, Carpenters Estate in Stratford, and the West Kensington and Gibbs Green estates in Earl’s Court. Similar destructive redevelopment processes have already come to their head at places such as Woodberry Down in Hackney, the Ferrier Estate in Greenwich, and Balfron Tower and Robin Hood Gardens in Tower Hamlets. In every case, anodyne language is a key tool – in media and entertainment representations, legal discourses and political rhetoric – in masking the underlying material and social violence of state-sanctioned gentrification. The choice of ‘anodyne’ to describe the language of the CPO is quite deliberate. It can mean both bland and seemingly neutral, but also has the meaning of ‘painkilling’ or ‘soothing’. Such language allows processes that involve quite significant violence – the forcible removal of people from their homes, the destruction of long standing communities, and the demographic ‘cleansing’ of areas of their working class population – to be presented as unremarkable. By familiarising ourselves with the kinds of language features used to convey this sense of the normality of structural violence, we can more effectively challenge these discourses – and help fight to prevent another Heygate. That’s brilliant, turning their tools against them – I imagine they’re not too fond of that!